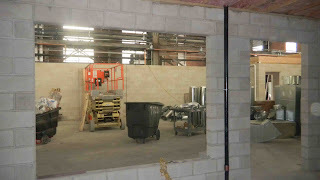 New Rescue Center - construction off to a great start! 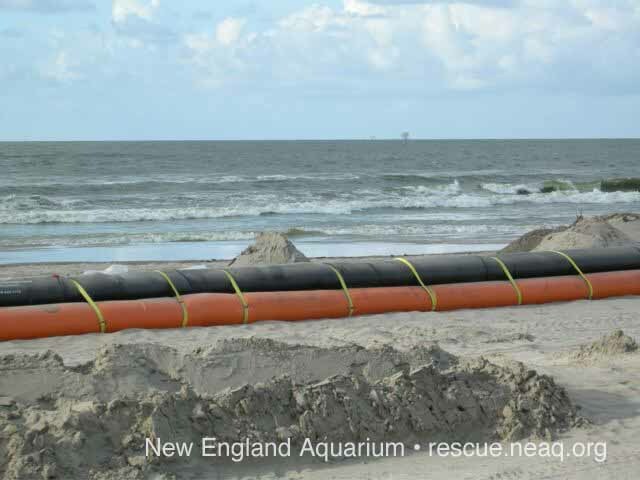 There is some very exciting news happening around the New England Aquarium. For those of you who are not aware, we are in the process of building an off site Rescue Center and collection holding facility. 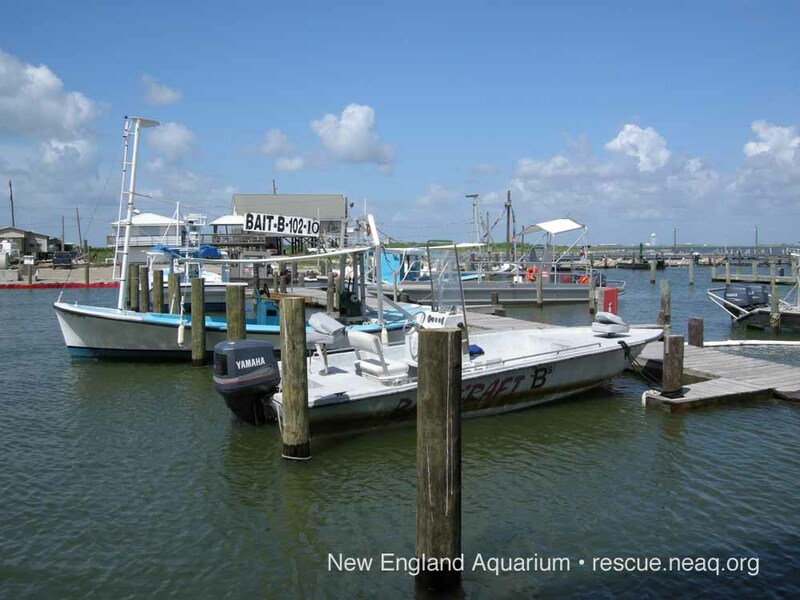 This new center is located in Quincy, Massachusetts and will provide additional holding and state of the art quarantine facilities for the Aquarium's collection, which is very exciting. What's even more exciting is the other section of this facility will be host to a new Rescue Center!! 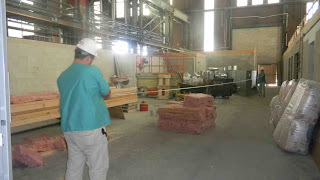 After a lengthy fund raising effort, we began construction at a warehouse on the Quincy waterfront a couple months ago. (See news coverage of these plans here and here.) As you all know the economy has been tight so we have had to create a phasing plan for this facility until we raise the remainder of our financial goal. 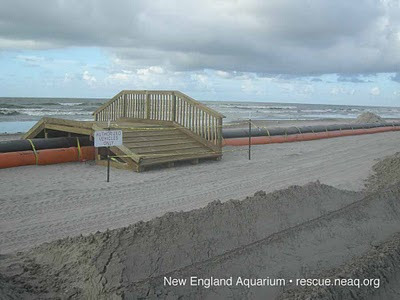 The sea turtle ward in phase one will be able to house as many sea turtles as our current capacity. 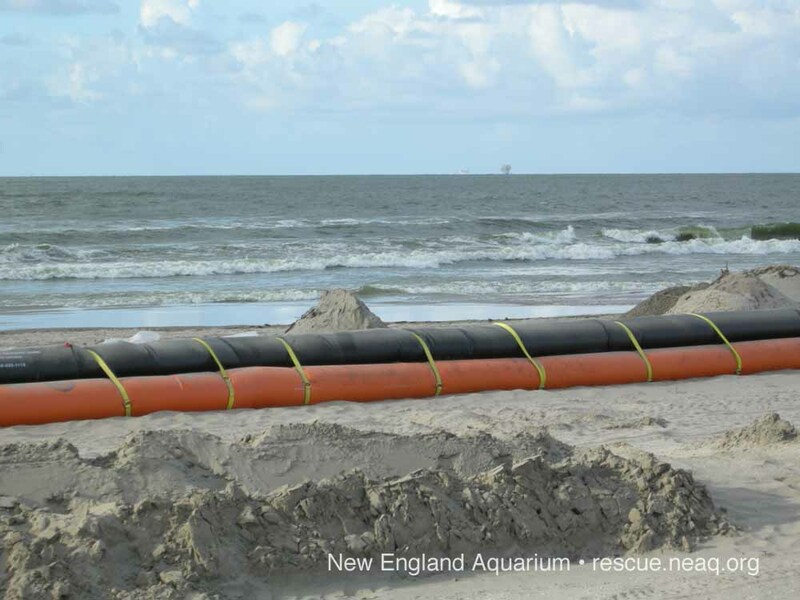 By the end of phase two, we will double our sea turtle capacity reducing the need to transport cold stunned sea turtles. This is exciting news! Construction on this building is in full swing. 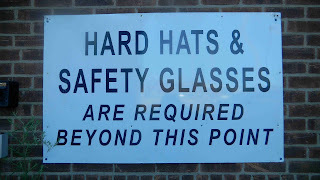 With workers everywhere, personal safety gear was required for us to even enter the building. 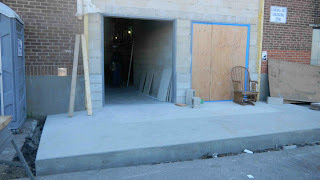 Before we entered, I took this photo of the Rescue Center entrances. 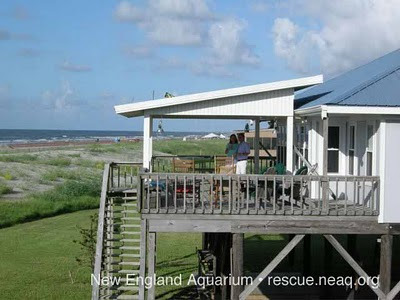 The left hand doorway enters directly into the sea turtle rescue hospital. The doorway on the right is completely separate and enters into what will be our new state of the art necropsy (dissection) lab. 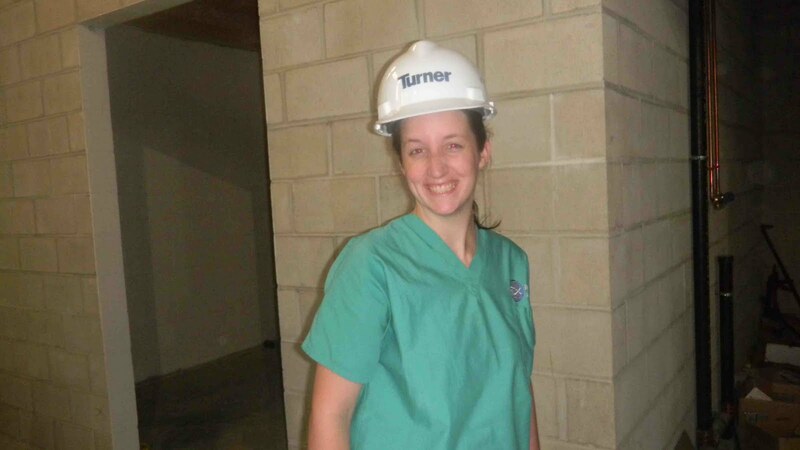 Below is a picture of Rescue staff biologist Kerry McNally as she admires what will be our new laundry room. Rescue work generates a significant amount of dirty laundry. Most of you have heard of and participated in our towel drives. A few times a year we host a towel drive (blankets and sheets are also collected) to get us through the year. Thanks to all the school kids and any of you who have participated! 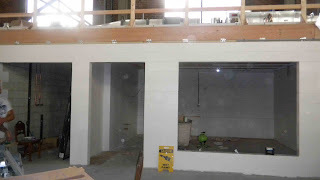 The photos below are taken from inside looking out (left) and outside looking in (right) of what will be our new treatment room. We included a large window in this room so we can observe the animal areas from inside the clinic while we work on sea turtle treatments. 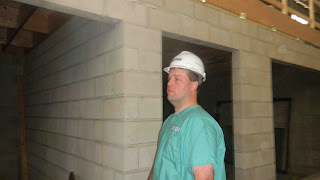 Below is a photo of Adam as he surveys the new hospital area. 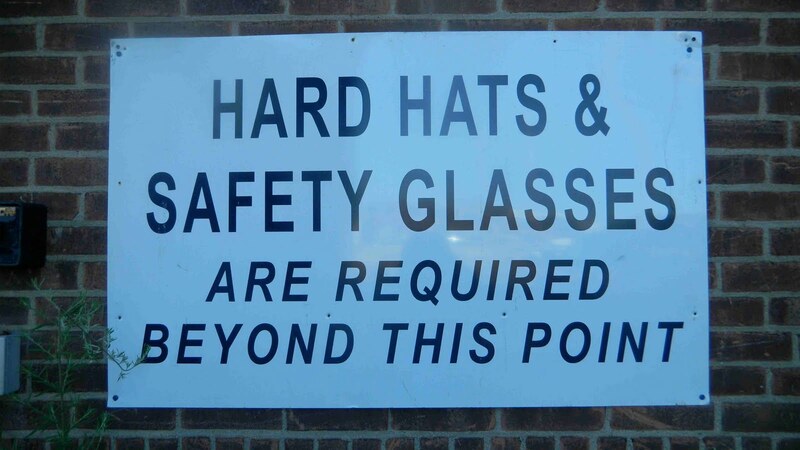 I just like the photos of him and Kerry in their hard hats! Below Adam and Kerry measure out a space where several sea turtle tanks will be placed. It is difficult to gauge the space in this photo so to give you a unit of measure, they are using a 100-foot tape measure. 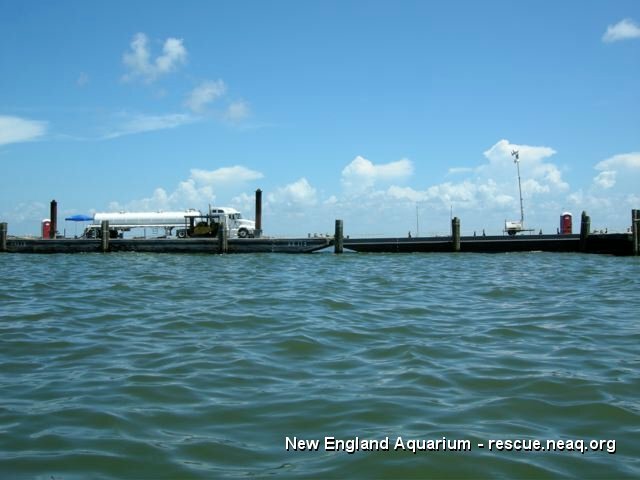 Of course with the keeping of aquatic animals comes a significant amount of life support equipment. Excellent water quality and temperature control are essential for maintaining the healthiest animals. 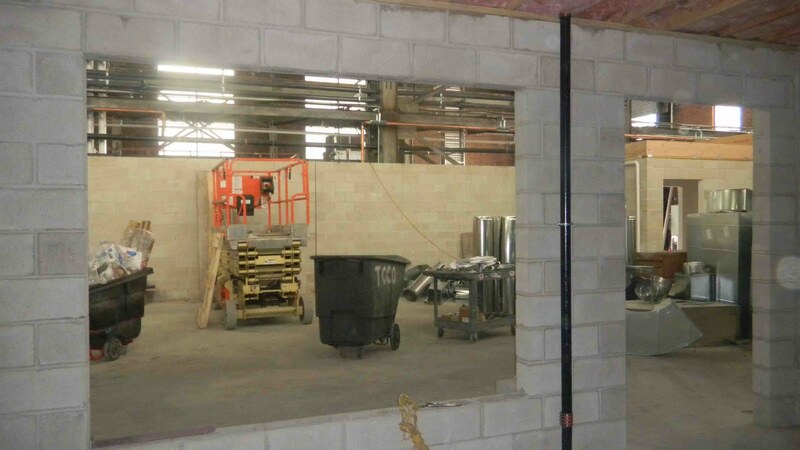 Below is a photo of just one of our life support sections that will be in this new facility. We still have a lot of work to do to prepare this facility for the first phase. We plan to have the first phase of the Rescue Center completed before the fall cold-stun season for the endangered sea turtles. We will need several weeks to move equipment, test water and get settled in our new home prior to the arrival of this year's turtles. 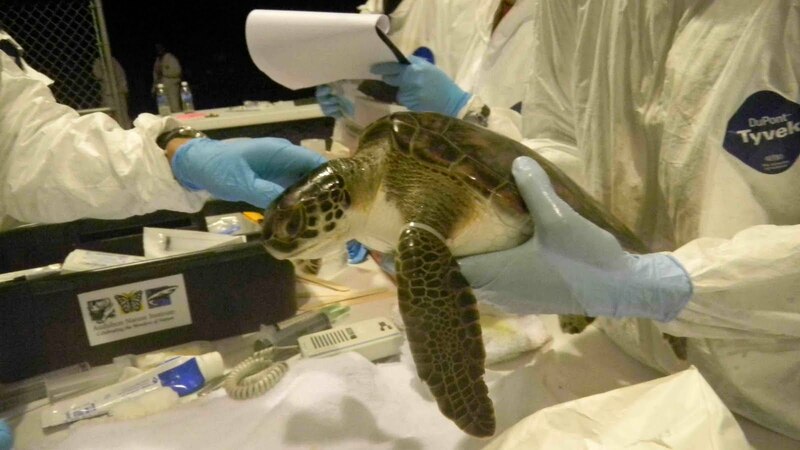 With the Gulf oil spill taking it's toll on endangered and threatened sea turtles, every turtle we save will make a difference in the population. 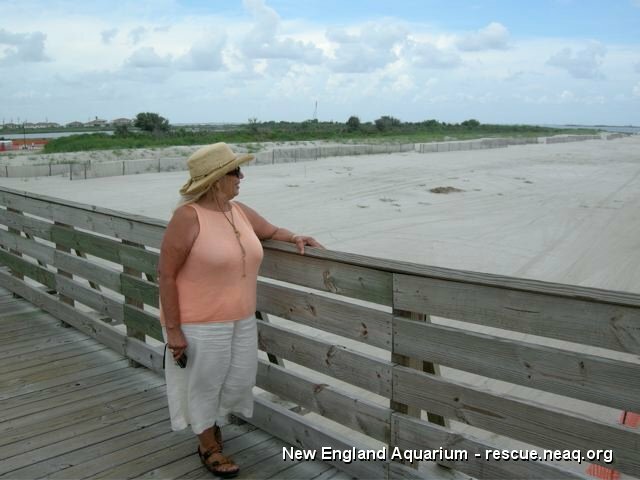 We have a long history of saving sea turtles and will significantly increase our ability to have a positive impact on their survival with this new Rescue Center. 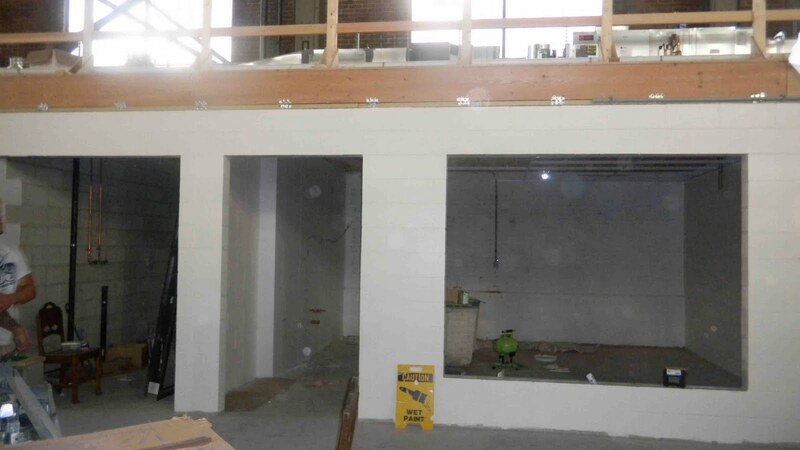 Click here if you’d like to contribute funds to help complete this facility. In this post, New England Aquarium President and CEO Bud Ris answers reader questions about a recent visit to the Gulf of Mexico. Q: Have you heard anything regarding Kevin Costners machines? 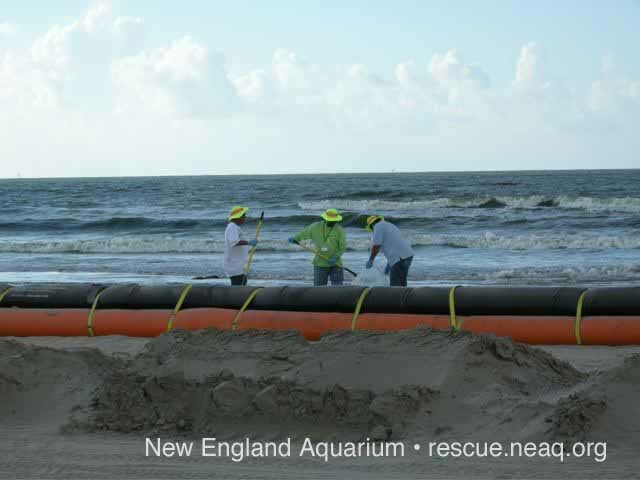 BP has ordered 30+ of them to help with the clean up. A: No, we didn't hear anything about Kevin Costner's oil separation machines down here. 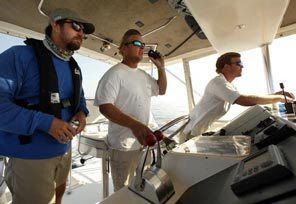 It is difficult to determine whether experimentation is encouraged, but we certainly saw a number of new things being tried out on the water. Q: i hope this tragedy has a better ending. Thank you to everyone down there looking after the sea life. I hope they contain this faster than it looks like it might take. 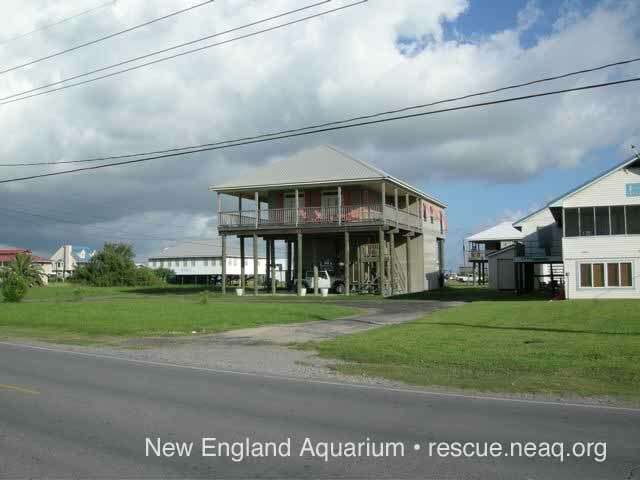 A: Everyone on Grand Isle was wonderfully thankful that we took the time to come down for firsthand observations. 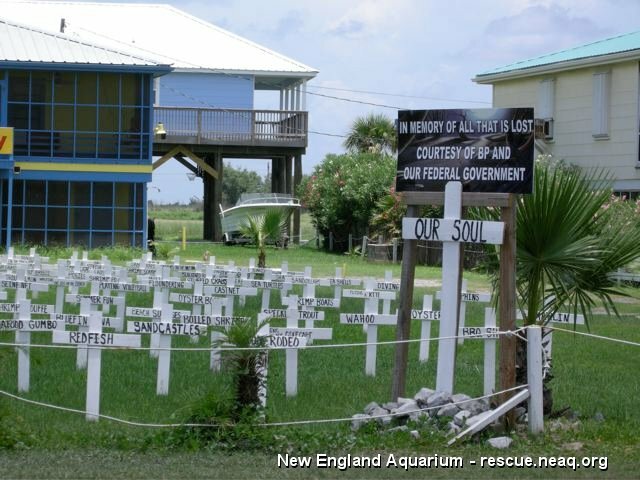 It seems very important to know that people "up north" care about their situation and the marine life in the Gulf. A: Thank you. It was very helpful to see things in person--especially to give us a better perspective on the magnitude and scale of the challenge facing the cleanup operation. Q: Let's hope these species are as resilient as Barbara thinks. A: Yes. If they can get the well fully capped soon, that will make a big difference. Q: Thanks telling us what's happening there! Looks like the defenses have closed that beach down, are most people not allowed to go see this? A: The beaches are, essentially, deserted. The public is not permitted to cross the fencing, and there is definitely no swimming. Although tropical storm Alex will not directly threaten Grand Isle, everyone is very concerned that the winds from the storm will push the oil toward the beaches and passes into Barataria Bay. Q: Are the locals getting financial help as quickly as has been promised? A: A lot of the fishermen and marina operators seem to be employed as part of the response effort. We saw many shrimp boats, for example, outfitted with boom and working with the vacuum skimmer vessels out on the water. 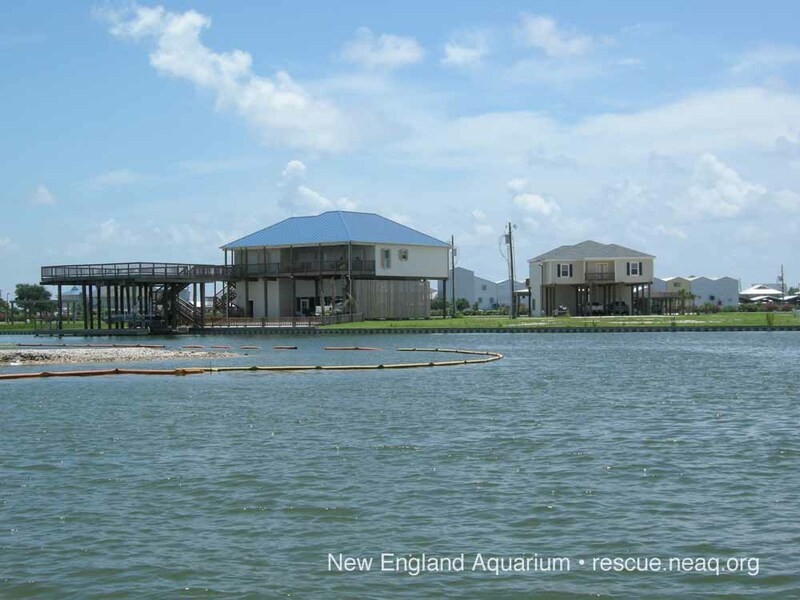 This post is written from Louisiana by Bud Ris, New England Aquarium President and CEO. 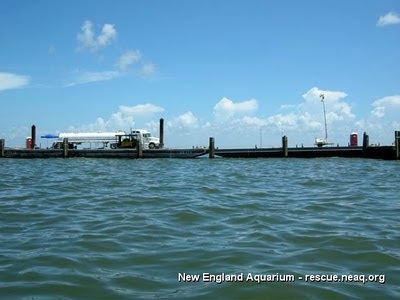 After viewing the defenses along Grand Isle beach (see previous post), we jumped on a couple of open boats today and headed off for a look at measures being taken to prevent oil from entering the large bay behind Grand Isle known as Barataria Bay. 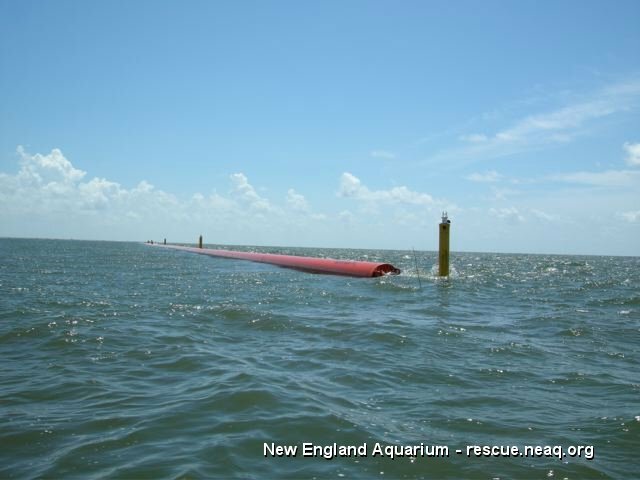 The challenge is to create a floating barrier across the "passes" where any oil flowing in can be contained, skimmed off the surface and barged to safe containment facilities on land. The conventional method is to use floating "boom" that we've all seen on the news reports on TV. Indeed, the word "boom" has become so prolific down here that it comes up in almost every conversation about the spill. But there is real concern amongst the local residents that the conventional boom won't be very effective when the wind picks up. They are deeply worried about how oil entering the Bay through the passes will not be held back by these booms, threatening the wildlife and everything else that is so important to the local ecology--and the economy. So one new idea is build a barrier across the passes with large floating barges tied to piles driven into the bottom every 25 yards or so. (You can see the new yellow piles in the photo above.) 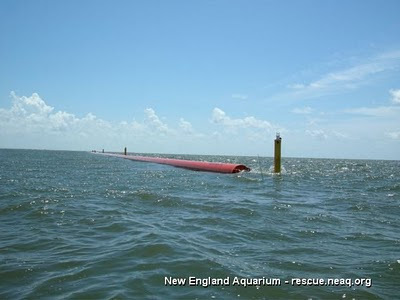 This looked like a pretty good idea to us, both because the barges seem much sturdier than the floating boom and because there was no interruption of the natural flow of water under the surface - which, of course, is very important to the ecological integrity of the Bay itself. Another idea--that originated with an engineer we met over dinner--was to lay a long string of 3- to 4-foot diameter pipe in 50-foot lengths, sealed at each end and filled with air. 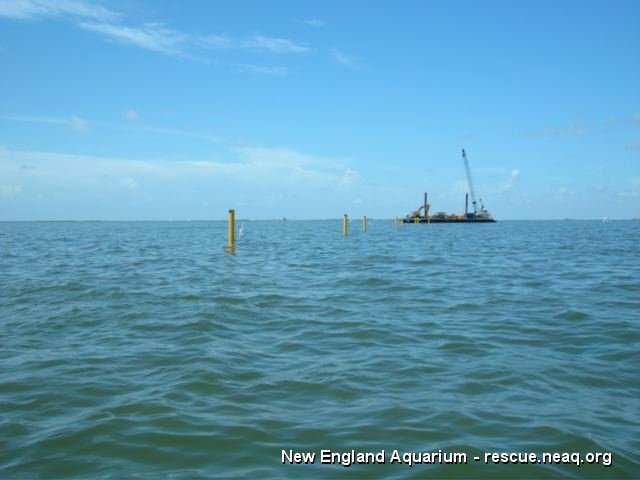 That's the floating orange pipe in the photos, pipe that has just been installed within the last week, moored to anchors or pilings similar to the barge barrier. Just as we finished looking at this new floating pipe, we had our first look at a small slick of oil in the pass. 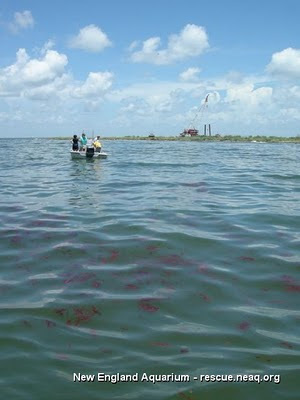 Some of it had a reddish color, probably from the chemicals used as dispersants. Some of it was jet black, impossible to get off your fingers. A black goo, one of our group called it "toxic taffy" as he attempted to scrub it off his hands with the detergent on board the boat. 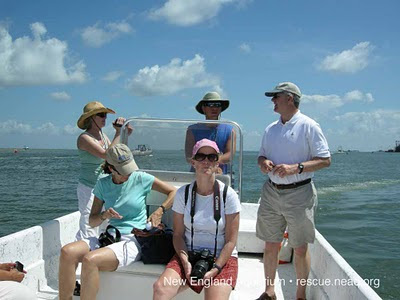 Just then we saw a pod of dolphins surfacing right nearby and we realized there was no way for them to avoid the slick. And a hundred yards or so away we saw a small group of pelicans covered with oil and one of our group worried they may have taken their last flight. A third option we observed involves construction of a series of artificial sand islands, built from sand dredged a mile or so offshore and pumped in under pressure. 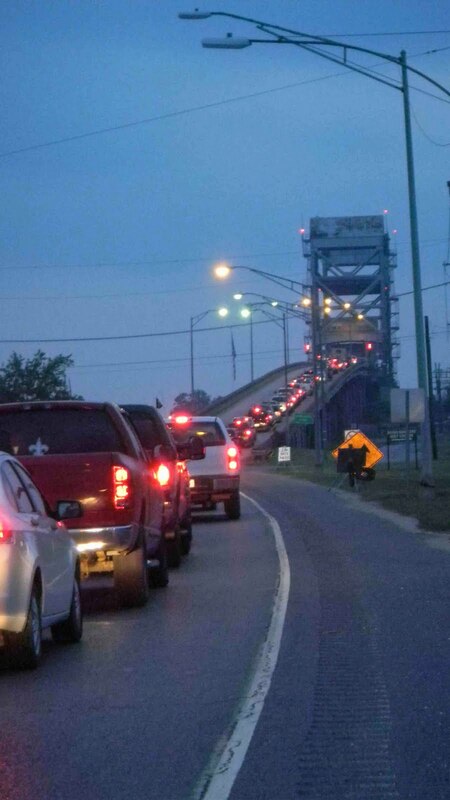 This is the controversial plan advocated by Louisiana Governor Bobby Jindal. There's much local debate about whether these artificial islands will survive a storm and whether they might cause more ecological damage than they "prevent." The debate is intense--indeed, construction of these islands has been temporarily halted while federal and state officials weigh the pros and cons. When you see all of these concepts actually being implemented on location, you can become somewhat hopeful. But then you look out at the production rigs just a few miles offshore, think about the amount of oil that has already been leaked and is still leaking, and the fact that the TransOcean well might not be permanently plugged until mid August, any degree of optimism fades pretty quickly. And you can see that many of the local residents know the wind and current will swing back their way soon, putting all of these defensive measures to the test like nothing that has ever been tested before. They are deeply worried, and we could feel their pain. Our host, Barbara Picard, has been an island resident for 41 years. When I asked her how she felt about the spill, she replied "It's devastaing. Really sad. I'm friends with all the fishermen, oyster people, and sports fishermen. They are all out of work. 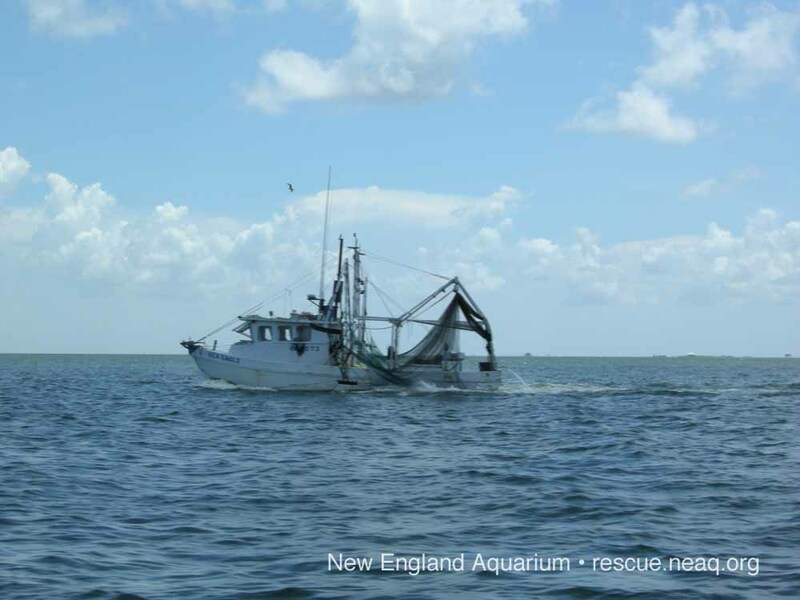 The fishing grounds are closed, and we know the oil will come back this way." But she also remains hopeful: "Seeing the water today with no oil. That tells me something out in the Gulf where the rig was is working. They must be slowing the spill; the skimmers must be working out there. That gives me some hope. But most off all seeing the many dolphins out there - as we did today -- that made me feel good again. 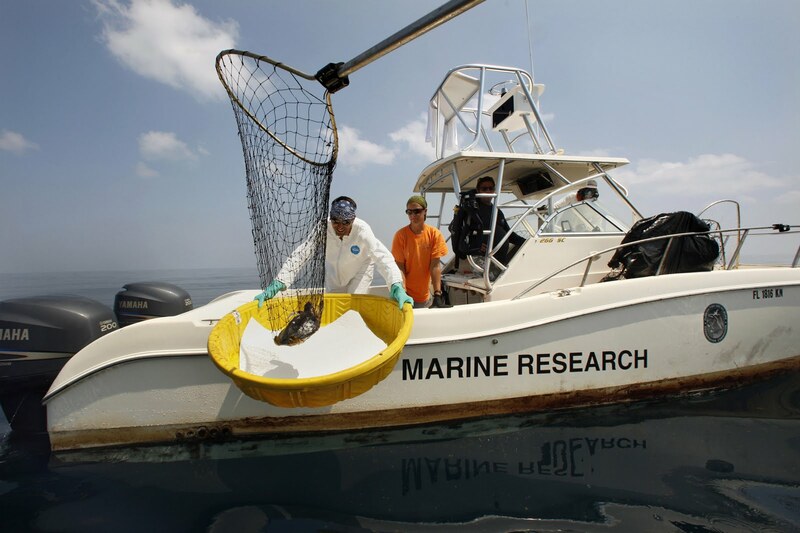 The marine life is incredibly resilient." Our contingent of New England Aquarium board members, led by Chairman, Bill Burgess, and I arrived in New Orleans yesterday. Our first stop was the sea turtle recovery center run by the Aquarium of the Americas, which Charlie and Connie have been reporting on over the last several weeks (Starting here, a full list of oil spill posts is on the right hand sidebar of this blog). But more on that later. Today we're out on Grand Isle, a seven mile long barrier beach, southwest of New Orleans, about a two hour drive from the city. Behind Grand Isle, lies Barataria Bay, one of the most important wetlands and wildlife habitat areas along the Louisiana coast. One thing you notice immediately is how high every home is built up on pilings--hurricanes are part of life down here. Oil first appeared on the beaches here several weeks ago, but then moved east, driven by the winds and currents pushing the spill toward Florida. In the interim period, a huge "army" of workers and equipment have moved in to install an oil barrier along the entire length of the island. The idea is to prepare for a return of the oil should the winds drive it back to the west. 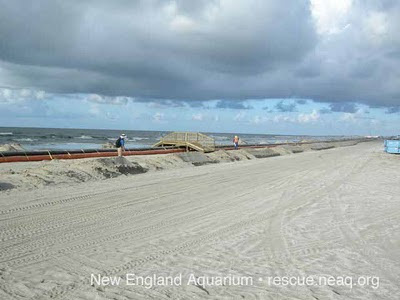 It is hoped that this barrier--with an extensive fence and lane for the constant stream of vehicles--will keep the slick from permanently fouling the beach, containing it in way that will allow it to be scooped up, placed in special containers and carted away. 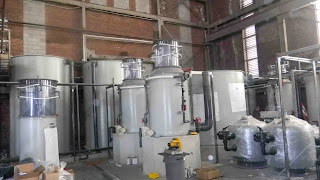 The operation is extensive and impressive. About every 500 yards there is a tent from where 20 to 30 workers mount regular patrols along the beach. Whenever any oil is found, which for the moment seems to happen only sporadically, it is quickly shovel up, put in plastic bags, and carted off. It is an impressive sight. But no one knows whether all these preparations will really work and there's a lot of discussion among the locals about whether the "defense" is focused on the right place. Some feel that it would be much more important to protect the "passes" (what we could call "inlets" up north) that open into Barataria Bay and the huge expanse of wetlands there. We'll be boarding a boat later today to view the preparations in these passes, and will be talking to some local fishermen and wildlife officials. I've had some time to catch up on other work and visit with my family. I even celebrated my Mom's 70th birthday this weekend - go Mom! Since my return I have received emails and other requests to continue providing oil spill updates. These will not include photos of the sea turtle rehabilitation efforts since I am back in Boston, however I will do my best to pull internet information together for you here into one blog. I'll most likely plan to post an oil spill update once a week, I'll aim for Wednesday or Thursday each week and try to be consistent so you will know when to check. 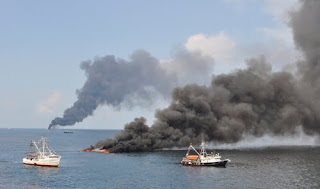 Several of you have expressed concern over the burning of oil at sea. These controlled burns have recently been the topic of discussion over multiple media outlets. In my opinion, one of the most interesting articles on this topic is by Los Angeles Times writer Kim Murphy. In her article Death By Fire in the Gulf she quotes the sea turtle biologists that are conducting the on water rescues of sea turtles from the oil slicks. You can feel the frustration from Blair Witherington, Florida Fish and Wildlife Conservation Commission scientist, through his quotes. You really need to read this article for yourselves, paraphrasing just won't do in this case. The photos below are from the Los Angeles Times. 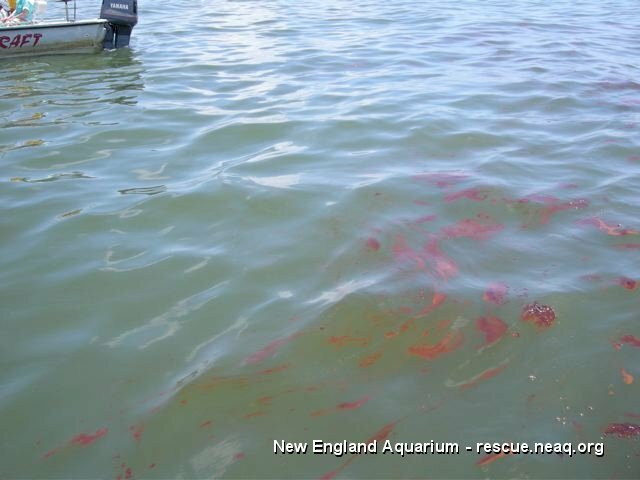 The photo on the left shows the rescue vessel in a slick of oil. The photo on the right shows scientist Blair Witherington with the turtle rescue team. The photo below is also from the Murphy article. It shows a small endangered Kemp's ridley being brought on board in the capture net. The photos below were taken and posted by the U.S. Coast Guard. The photo directly below on the left shows a vessels corralling oil into the controlled burn. In the distance, a second controlled burn can be seen. The photo on the right shows a chain of controlled burns with vessels of opportunity nearby. 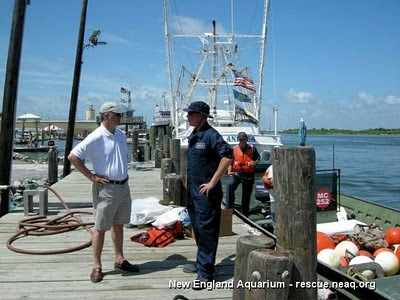 The photos below are from the crew of the Juniper, a local Cutter from Newport, RI. 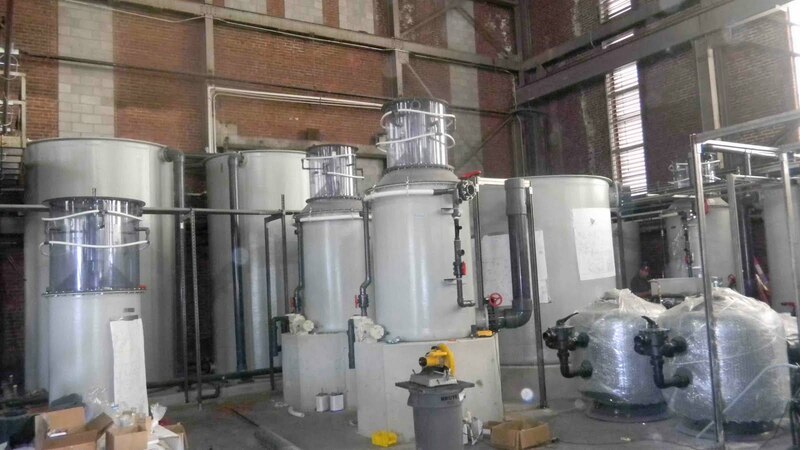 In the photo on the left the crew checks the level of water and oil in the ships storage tank. 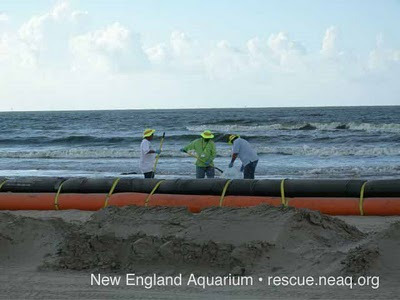 The photo on the right shows efforts by the same crew to skim oil. 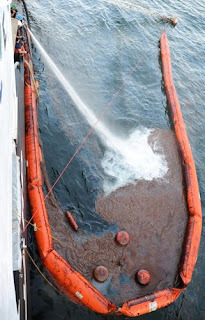 A fire hose is used to direct the oil toward the recovery pumps. Both photos above taken by Petty Officer 3rd Class Colin White. I'll close this blog with an exceptionally interesting map that was emailed to me today. 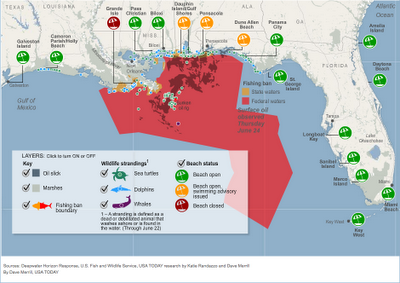 This is an interactive map from USA Today detailing the locations of oiled animals by species, oiled beaches, closed beaches and more. Check out the many tabs and settings - this is a mapping masterpiece, people. Please do check this out and look at each tab. Don't miss the last tab and try clicking on the different sections in the diagram for further details. Map by Dave Merrill, USA TODAY. Click through to the original, higher resolution interactive map. 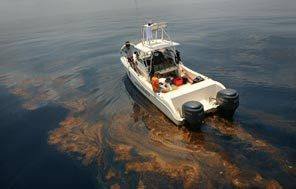 The oil spill continues to draw great interest and strong emotions. I have decided to provide blogs on the oil spill once a week as per your requests. I have had many request to continue from friends, colleagues and strangers. I've also had several requests from citizens of neighboring countries or countries half way around the world who were getting most of their information from this blog. 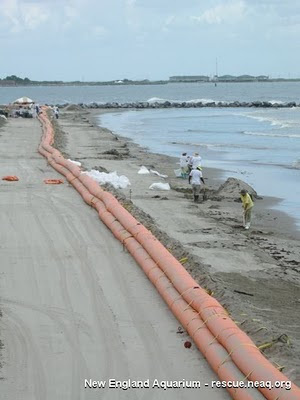 I am told that the oil spill coverage is minimal at best and non-existent in many countries in favor of the World Cup tournament or other news stories. I'll do my best to keep you informed. It is with mixed emotions that I write this blog from a coffee shop back in Massachusetts. My last two days in New Orleans were very busy with more groups of sea turtles coming in each day. Wednesday I flew home but unfortunately spent the majority of my day in airports since my original flight was canceled. I am finding it difficult to allow my mind and body to rest. The past two weeks have been a firestorm of activity, both mentally and physically. Each little animal is imprinted in my mind and I'll worry about them until I learn of their release. It's difficult to let go after investing so much in their therapy. Fortunately the animals are in skilled hands. 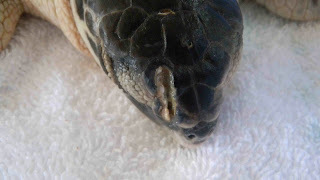 So, you've seen your share of sea turtle photos from New Orleans, heard my detailed accounts of the long hard days, read descriptions of the extreme heat (and sweating profusely), and learned about some of our medical cases. There isn't much to add to all that so I'll close my New Orleans blog series by discussing some of the "behind the scene" things you don't see. First, the team of people that came together for this rescue and rehabilitation effort are unique and dedicated folks. I'm proud to have worked side by side with each of them to save these endangered species. Generally people in this field are easy going and tend to have a great outlook on life. That certainly makes it a pleasure to work with them. We had a lot of great laughs during our time together, some of which I'm still chuckling at! Below are some photo of the non turtle related parts of my adventure, enjoy. 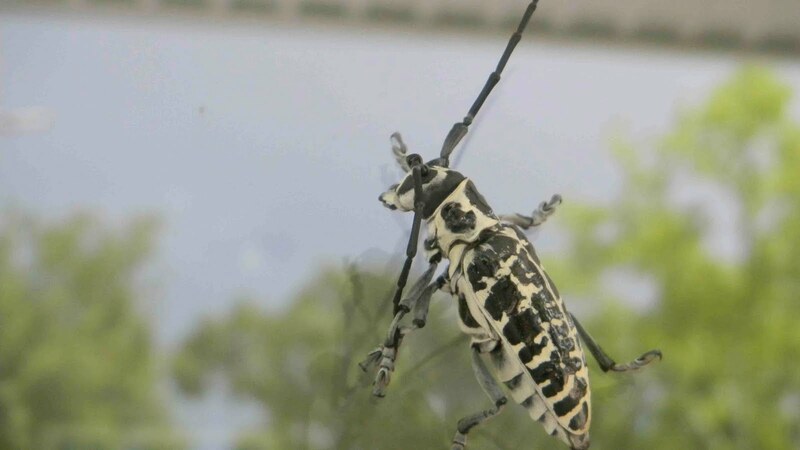 New Orleans is home to creatures very different then what I'm used to here in Massachusetts. Below are a few critters I encountered. 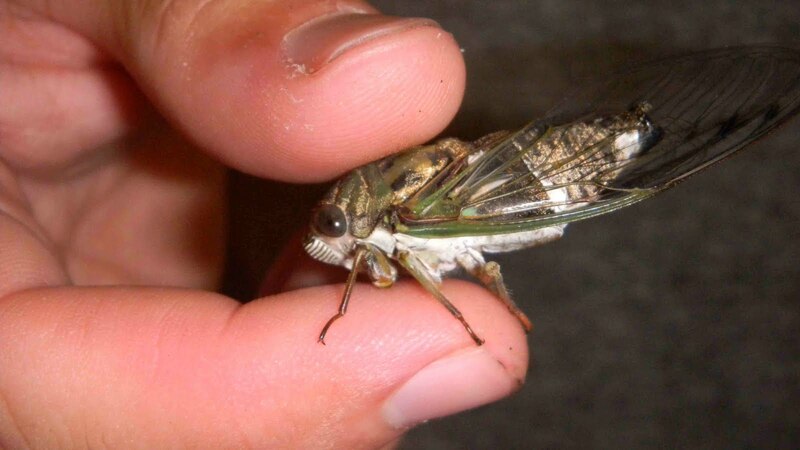 The animal on the left is in the beetle family while the animal on the right is a cicada. Dr. Boylan (from the South Carolina Aquarium) tells me this is a green frog. This tiny animal had very sticky feet. In the photo below, Dr. Boylan and Marina (Biologist from North Carolina) search for three mink that ran across the road in front of us. 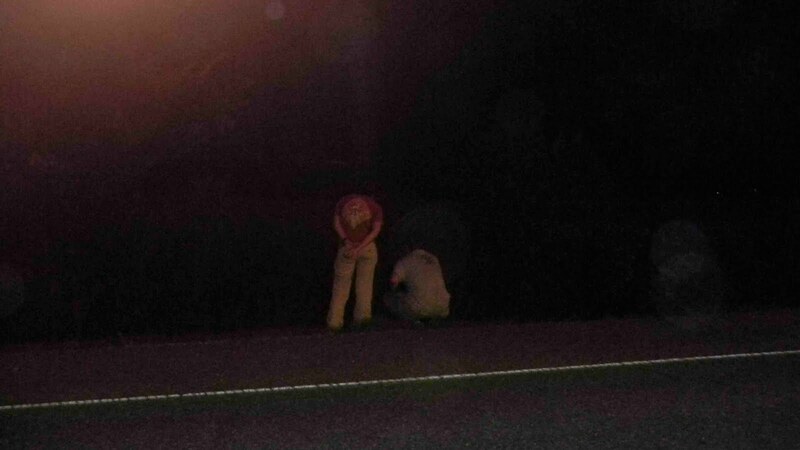 We couldn't see them very well in the dark but they did chuff at us. We made our exit after the chuff--no need to stress them ... or take a mink bite to the face! Check out Dr. Boylan's t-shirt below. I spotted this and had to have a photo. Apparently the South Carolina Aquarium received a grant or a gift for a new digital radiograph machine. Funds weren't enough to cover the entire cost so they raised the money through a turtle party (not entirely sure I have that story correct--Dr. Boylan or others from the SCA please feel free to set me straight here). I just love this shirt! Dr. Boylan and I had bad luck with bridges during our stay in New Orleans. On two occasions, we got stuck in bridge traffic when draw bridges failed to operate. 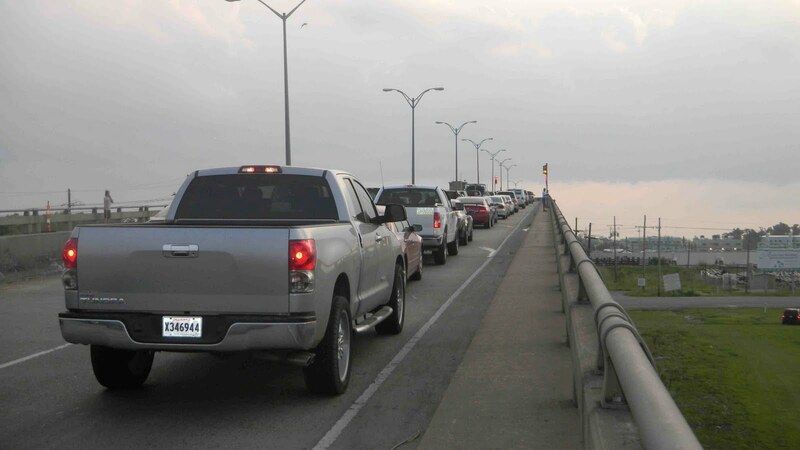 In the photo on the left, they never got the bridge operational and we all had to back down off the bridge. This was particularly annoying since we were tired and hungry and just trying to go up the road to a popular eatery when we got caught. An hour later we ended up back at the hotel with no meal! I was little help with the good doctor's frustration level, adding to it I'm sure by laughing. Not a helpful response--sorry doc! Thanks again to all for reading these blogs. Special gratitude goes to those of you who posted comments of support. I shared them with the other members of the team during our long hours together and all were touched and very grateful. To Candace, thanks again for sending the Dancing Deer treats. They were delicious and on several occasions became lunch or supper! If you live within driving distance of the New England Aquarium, I would like to invite you in for a personal tour of our sea turtle clinic. Please message the Aquarium on facebook with your email address and our web team will make sure I receive it. Time now for some well needed rest. I'll turn the blog back over to Adam and Kerry for a few days while I re-unite with my family. 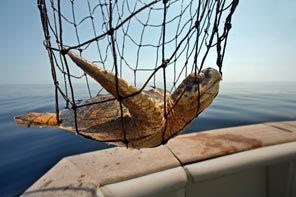 While I was gone Adam, shipped several or our sea turtles to Virginia for release (news story here). Look for a post shortly on those events. I'm not completely finished with the oil spill blogs, I'll try to post updates from time to time. One area of interest to me is the press conference held by Congressman Markey in Boston a week ago. He made some powerful and important statements at that time. After a weekend of rest I'll provide some insight into his press conference. Let me sum up yesterday's activities for you in a few words: busy, rewarding and yes, our old friend, hot! Dr. Boylan (from the South Carolina Aquarium, check out their sea turtle hospital blog here) and I started our day in Tyvek suits giving the new turtles from the day before their second bath. In addition to a second bath, they each get a full exam (more on physical exams in this previous blog) and any prescribed medications. We then administered daily treatments, admitted a new sea turtle (non-oiled), completed exams and were setting up for a group of 11 incoming turtles when the transport van pulled up. It was a full and rewarding day. 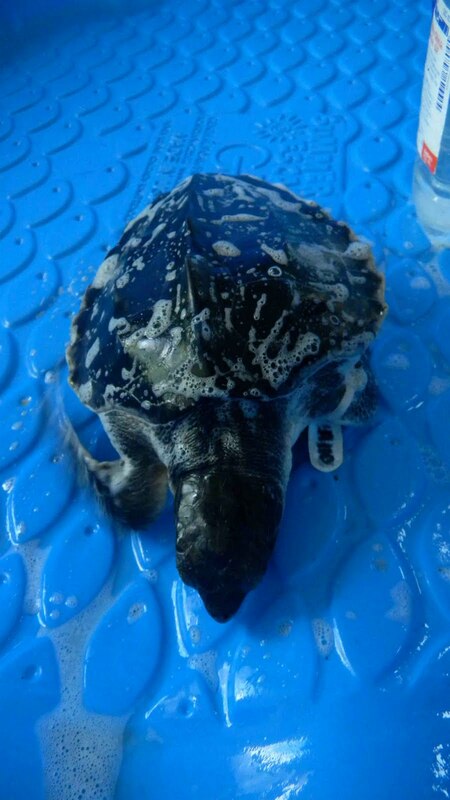 We were short handed in the morning so I was bathing the turtles myself while Dr. Boylan wrote up the exam findings and prepared medications for each animal. We were working side by side so from time to time I'd have him hold a turtle if I had an active animal. The majority of the turtles here are quite small; picture a dessert plate with a head and flippers - that will give you a good idea of their size. I wet a large size sponge and placed each animal (one at a time) on the sponge. They completely relaxed on the sponge and it became very easy for me to thoroughly clean them. I used a toothbrush to be sure I could get in all the folds in their skin. 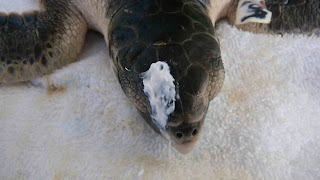 The photo below shows a little sea turtle resting calmly on the sponge during the bath. During the second bath and exams I discovered a difference in the rear flippers of one of our turtles. The left flipper looked larger to me so I called over Dr. Boylan, who agreed. The left rear "knee" area was swollen in comparison to the right limb. 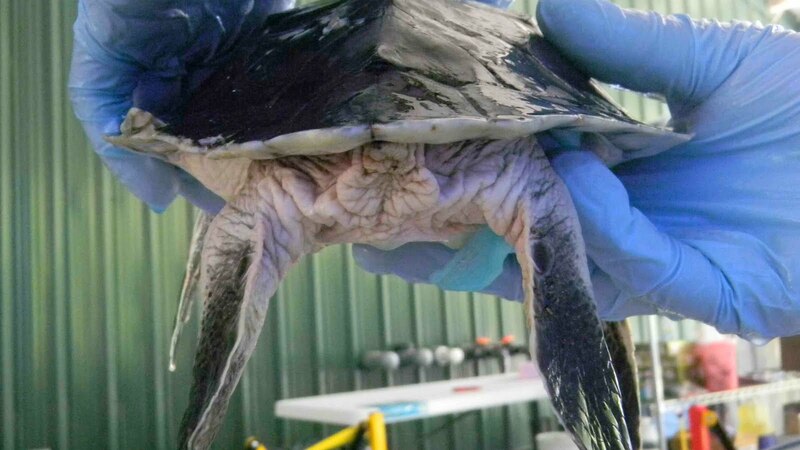 We scheduled this turtle for radiographs asap. In the photo below on the left you can see the enlarged limb, in the photo on the right you can see rear view of both limbs. The left limb is clearly larger then the right. These are important observations as this could indicate infection, fracture or other medical problems. Below is an update on the cranial fracture case that came in the other night. 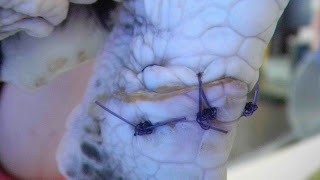 The photo on the left shows the wound after I flushed it out with sterile saline. The photo on the right shows this same turtle after we applied a silver based ointment. 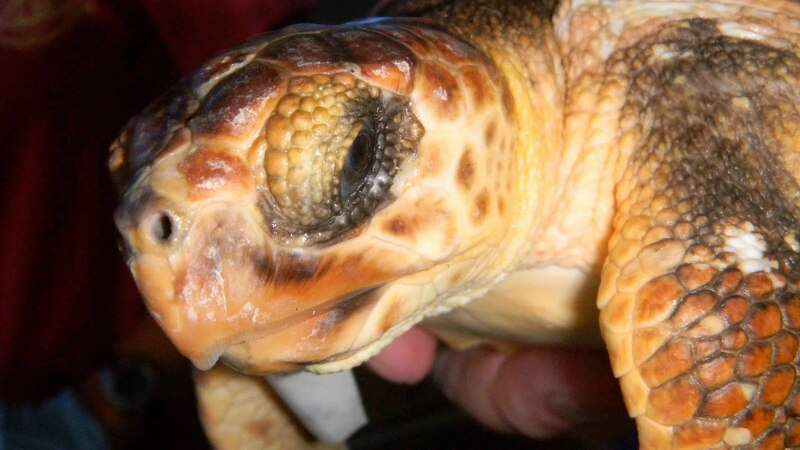 This is a photo of our little loggerhead, the animal I named Red Louie. Red Louie had radiographs (x-rays) the day before yesterday. Unfortunately the rads show that Red Louie has pretty severe pneumonia. He is in guarded condition and his prognosis is difficult to predict. The veterinarians evaluated his condition and put him on the best possible medical plan. 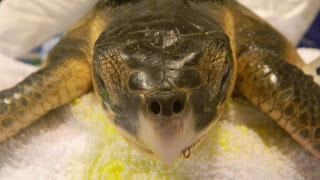 As many of you know from our cold stun blogs, pneumonia in sea turtles is very serious and can take months for therapy. Nearly two weeks ago Dr. Innis performed surgery on the rear flipper, shown below (click here for original story) of one of the sea turtles. The wound is healing nicely. After the second round of bathing, a new patient exam, and scheduled treatments, we began to prepare the red zone for 11 incoming turtles. The heat index was again over 100 (I think it was over 110) so I prepared a cooler full of Gatorade and water for the staff and volunteers who would be coming in to help with the incoming animals. The animals that came in with this group were heavily oiled. Below is one of my cases. After a full physical exam including collecting a respiration and heart rate, examining the animal for wounds or injuries and other exam procedures, we give the animal a brief de-oiling using mayonnaise smeared on gauze. The oil sticks to the mayo covered gauze and is highly effective for removing the base layer of oil prior to the bath. In the photo on the left shows a large ball of oil in the skin folds behind the right rear limb. 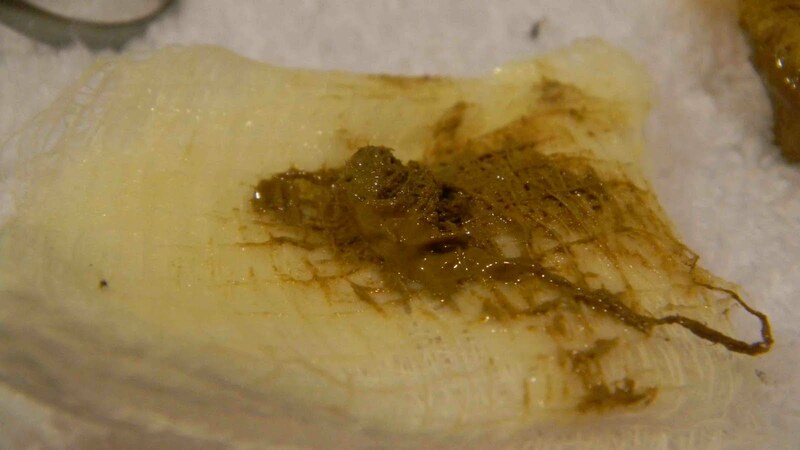 the photo on the right shows the oil plug on the mayo covered gauze. Below is another case I worked on last night. 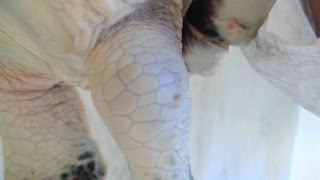 I took this photograph to document a shallow indent on the skull of this turtle. 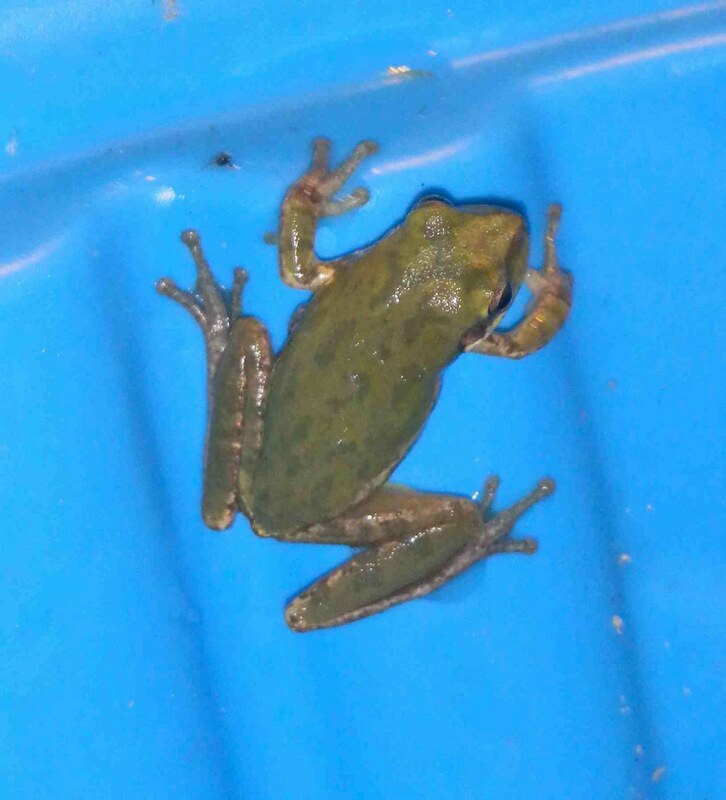 The photo didn't come out great but you can see a sheen of oil on the skin of this animal. 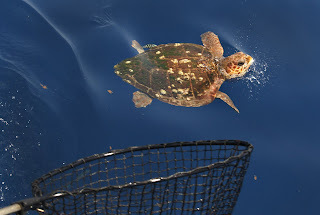 Just when I settled on the name Oblio for our lone green sea turtle (meet Oblio in this recent post), another green turtle came in last night. 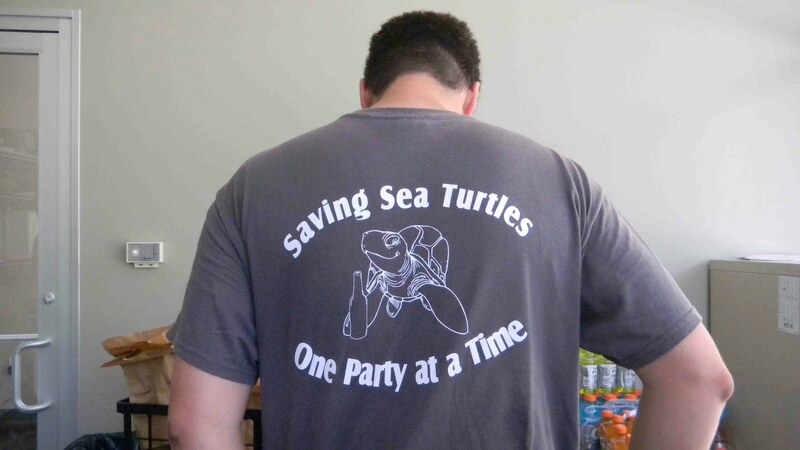 The new green turtle is considerably larger then Oblio, probably about 4 or 5 times larger. I think it's clear that this one should be named Arrow. For those of you interested in the origin of these names see below. With admitting 11 animals, comes collecting 11 sets of biological samples. Below is a photo of the sample preparations carefully done by the lab technicians. 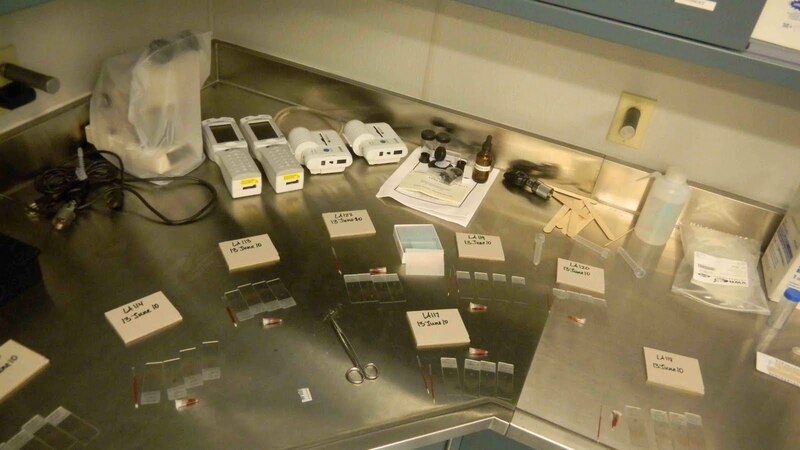 This photo only shows a fraction of the samples since they didn't all fit in the shot. 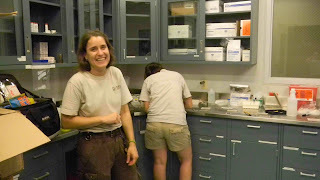 The photo on the right shows Mel (in foreground) and Sarah as they work in the lab. We call them the super techs - which they truly are!!! What blog would be complete without a weather update from me. Today at 6:30 a.m. the heat index was already at 94 degrees. The heat advisory continues as does the profuse sweating (too much information?). That concludes today's sea turtle blog. I'll describe the origin of the name Oblio as best as I can remember it below so those of you who don't want to continue reading may tune out - thanks for your attention thus far. Since several of you emailed me asking what Oblio meant, I'll give you a quick peek into my dehydrated thought process for this name. Oblio was a character from an animated short movie many years ago. My memory is dehydrated too, but if I remember correctly Oblio was a little boy with a round head in a world of cone heads. He was unique and stood out in the cone-head world. He left or was ousted from the community in search of others like him. He left with his only friend, his dog Arrow. He searched high and low without finding any other round heads. After much growth, his head transformed into a cone head. Once a cone head he returns to his village to find they have all become round heads. He was unique and special to the end. If I have this wrong and any wants to correct me please leave me a message in the comment section. NOTE: In fact, Connie may not have been far off! Click here for some more information about the film.